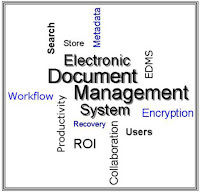 Document management has been a source of frustration throughout history from the earliest cave drawings to entire rooms dedicated to paper file cabinets to electronic document management systems (EDMS), of which some of the earliest date back to the 1980s. From that point on, the evolution of EDMS has continued at an amazing pace and businesses ranging from the florist down the street to large multinational enterprises have implemented these systems with highly positive results. Below are the top three reasons for implementing EDMS in your business. All businesses, large or small, obviously deal with paper and electronic documents on a day-to-day basis. How much time is wasted making copies and trying to lay your hands on “that one document” you have been searching for all day? Sure, Windows could be used to manage files, but with an EDMS, documents can be easily located through either a keyword or a full-document text search placing any document you wish to retrieve at your fingertips anytime. How much space in your business is dedicated to a hard copy filing system? How many times has a document been misfiled? How many times has a document been filed and never reviewed again? This is space you could reclaim to use in any number of ways, for instance, new equipment could be added without the need for obtaining larger premises. There are, of course, documents that need to be retained in paper form for legal reasons, but an EDMS can drastically reduce the amount of file storage in any office. Every organization has security requirements and it seems that on a daily basis there are reports of security breaches. Physical files in an office may be under lock and key, but are they really secure? Many EDMS have built in security. DigitalDrawer from AscendoSoft maximizes security by using 128-bit AES encryption ensuring documents are not readable except through DigitalDrawer. Other security aspects include: Role-based security, permission-based access and audit trail of user access, encrypted file names, and the ability to redact or hide personal information if necessary. When an EDMS is implemented, it is important that it is rapidly deployed, user-friendly and cost-effective. Once fully integrated and accessible across departments the workflow is streamlined and your ROI is significantly increased.